Hastings United’s footballers will have a home tie in the next round of the FA Cup if they win their replay tomorrow (Tuesday). The winners of the second round qualifying replay between United and Herne Bay will entertain Poole Town in third round qualifying on Saturday October 10. Poole play their football one level further up the non-league pyramid than United and Herne Bay. The Dorset outfit lies sixth in the Evo-Stik Southern Football League Premier Division with 18 points from 10 games. Poole have won 1-0 at home to Barnstaple Town and 3-2 away to Hayes & Yeading to reach third round qualifying. 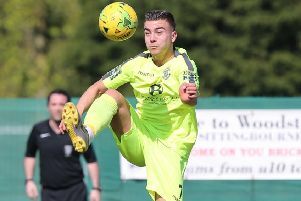 United had to settle for a 1-1 draw away to fellow Ryman Football League Division One South side Herne Bay in the initial meeting between the clubs on Saturday. The U’s took a 24th minute lead through a cracking strike by Sam Cole and Herne Bay had a player sent-off a minute later, but the Kent side earned a deserved share of the spoils courtesy of an 87th minute penalty. The teams will meet again at The Pilot Field tomorrow night, kick-off 7.45pm. Second round qualifying winners receive £4,500 from the FA’s prize fund and third round qualifying winners earn £7,500.